MINNEAPOLIS, Minn. – The Gustavus women’s swim and dive team climbed another spot in the MIAC Championship on the final day to take home a second place finish. St. Thomas took first place with a score 797 while the Gusties scored 588. The women started their day with the 1650 free where Sydney Hallmark and Allie Mayfield finished in sixth and seventh respectively for the Gusties with times of 2:04.82 and 2:09.15. In the 100 freestyle Maggie Webster took second with a 2018 NCAA Selection Time of 51.55, while Alyssa Lokensgard and Alyssa Kohorst took seventh and eighth respectively. The 200 breaststroke was the next event and Hailey Auran took home All-Conference honors with a third place time of 2:22.55. Haley Pesik finished fifth in the race for the Gusties while Ella Benoit took eighth. 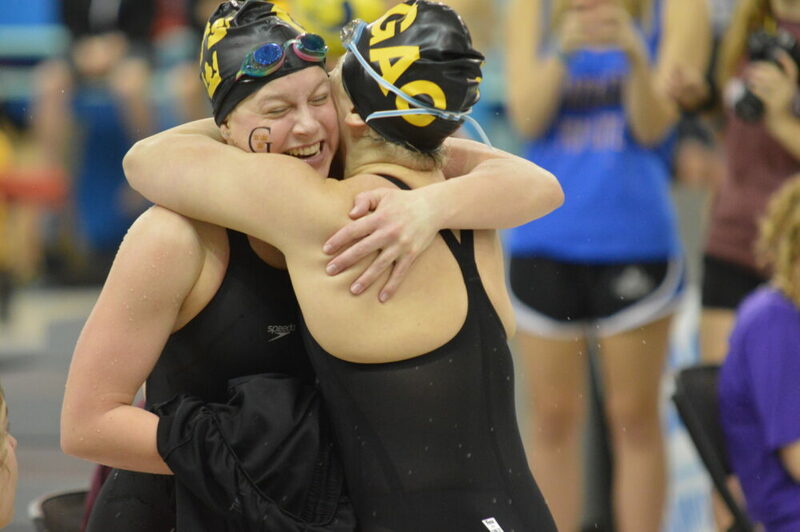 In the 200 yard butterfly, Hallmark brought in more points for the Gusties with her sixth place time of 2:15.53. Sophia Steinberg followed up that performance with a second place finish in the one meter dive. Steinberg was able to garner All-Conference honors with her score of 427.65. In the women’s final event of the day, the Gusties 400 freestyle relay team took third place with a time of 3:33.14. Once NCAA Championship selections are made, the meet will be held Mar. 20-23.